Luke is having a bit of trouble with his game. It comes as no surprise, as this is common with a golfer who experiences early success with automatic golf. Sorta seems like this is a way for the game to get back at you, once you think you’ve got everything under control, it is snatched right out from underneath you. But fear not. 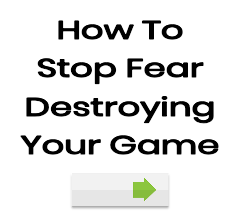 There is a way to get your game back on track and beat the demons. Here’s the first part of Luke’s email with my comments below. I’ve been playing really hot the last few weeks and my long game in particular has been awesome. I’ve literally been stepping on to the tee, not been bothering with a practice swing and just tanking the driver! Anyway, jump to Friday night and I figure I’ll get 9 holes practice in before the weekend. I got out there and I just stunk. I just put it down to a bad round, put it out of my mind and told myself that I’ll be back on form for the weekend competition. Anyway, I get to the competition and I’m even worse. I’m all for not giving up and saving a bad day with a good short game etc etc but I just couldn’t keep it on the golf course. Was either a 30 yard pull or a huge slice – a huge two way miss basically and nothing like the easy game ive been playing the last few weeks. I wish I could put it down to nervousness or too much expectation but I really can’t – I was relaxed and just ready to play golf and treat it like any other day. First off, no matter how good you’re going to get in this game there will be bad days. There could even be horrible days and you could string a few of these together. God knows I’ve had my fair share. A little story: I’ve just completed a successful season for my golf team. Out of the eight matches I played I won 7 of them. This was pleasing for a few reasons but the most satisfying of all was my comeback from a little hiccup mid-season. It’s hard to describe how badly I played this day. Missed the green with a wedge at the first, a shortish putt at the second didn’t hit the hole, pull hooked a 6 iron at the 5th and that was the good stuff. On the 7th I hit 3 balls in a row out of bounds. The 3rd attempt was a three iron (just to find the fairway) and I pull hooked that so far out of bounds that I conceded the hole to my opponent, despite the fact he was having his own trouble. I stuffed up the 8th and 9th hole to turn 5 down. When I lost the 10th I was in big trouble. At the 11th my opponent hit his tee shot in the water. I decided to take a few swipes in the trees (after another bad drive) and gift him a halved hole. It was horrendous and the only respite was when I finally lost the match 6 and 5. It was good to get off the course and put the clubs in the car. My point here is I quickly brushed it off as a bad day. It’s easy to contemplate and try and work out what went wrong – this seems like the right thing to do. My approach is counter-intuitive, but I know it works better than all the story telling that used to happen. From here I played some very good golf, that really really really bad round had no effect. Here’s another story to make a point. Rory Mcilroy had a horrendous tournament in England last week. He shot 74 and 79 and missed the cut by a mile. He may have been injured or sick but the chances are he just didn’t quite get it together. It’s a fine line sometimes. What should Rory do? Should he rework his swing and try and figure out what went wrong or does he tee it up next week and play the game? I know what I would be recommending. Have you noticed Mcilroy does this quite a bit. He’s a bit up and down and I don’t mind it. He’s never going to win every week (who does?) but when he’s on the boy can certainly play. So while he wouldn’t have been a happy camper about his form, I doubt it will worry him too much. So many golfers have destroyed themselves by hitting the panic button and then trying to fix every bad shot and score they’ve had. Sometimes it’s probably a better approach to let the bad score be and walk away with the mindset that you’ve learned something useful. So rule number one is to appreciate that bad golf is part of the game. It’s not great when it happens, but the quicker you can accept this the faster you’ll be able to move on. Rule number two is to learn rule #1 as fast as possible. But what else can yo do? So, what is your advice to someone who suddenly loses their swing like this from playing really well? This has happened to me a bit too often over the years and while I’m trying to remain philosophical, it can frustrating. I’m all for a good mental game, automatic golf etc and I have no desire to get mired in the world of swing mechanics and ill informed pros again, but would you say this is something I need to work out on the dreaded range? Or do you think it’s something that can be addresses mentally. One of my favourite strategies is to play more conservatively. This automatically means I’m not going to reach for the driver and/or try and hit every shot stiff to the pin. This conservatism is more of a mindset thing. I play away from the trouble and give myself the largest landing area. It’s not always the most fun (hitting 5 irons off par 4 tees is kinda boring) but it’s what you’ve gotta do sometimes to get back in the game. It’s less fun chipping out of the trees and making double bogey on 5 holes in a row, so don’t let your ego get the better of you. I’m also convinced that after a little bit of success golfers fall out of automatic golf. That is, they stop doing what was working for them. It’s usually subtle, but it’s enough to derail you. What’s required here is awareness. Are you aware of your thoughts, feelings and emotions? Luke hints that he is. Really, the only issue I can think of with my recent mental approach is that I kept thinking the recent upturn in form had me playing above my level and that I expected to fall back down to earth soon, no matter how much I tried to tell myself that I’m just this good. Do you think such a subtle thought like that could have become a self fulfilling prophecy? I know the negative mind can be very suggestive. If so, how do I get back to where I was and how do I stay there?! This kind of thinking is almost always negative in the long run. And while it’s hard to stop the thoughts, awareness of them is enough to stop their frequency and negative impact. Awareness is noticing what is happening without reacting to the garbage. Let the thoughts come and go but don’t place too much emotional value to them. This is a really hard lesson to grasp and learn and why it’s easier to work on something a little more tangible, like fix your back swing. But this is where the real skill lies in the improvement cycle. Unfortunately it’s not taught that often and I doubt it ever will be. Proper thinking and mental skills have definitely made some impact on the golf world, but the quick-fix mindset still dominates the sport. You only have to pick up any issue of a golf mag to see this. 4. Repeat until you find yourself at the 19th. I know the above four steps all sound too easy. But what else can you really do? If in doubt, take the simplest approach first and I’m pretty sure you’ll never be disappointment for too long. If that fails the final thing would be some expert coaching. I battled along for years trying to figure a lot of this stuff out myself – and while it has been an interesting journey, faster progress would have been made if I asked for help. To be honest, I was scared of talking about my fears and issues with someone else. It’s not easy. Proper coaching makes you feel uncomfortable. You get pushed hard and you have to answer some tough questions. There’s nowhere to hide and it’s definitely not for everyone. But it’s probably the only way to get an objective look at your game without any distractions – we tend to see only what we want to see. If your game is not going in the right direction and you’re stuck, then contact me and we can discuss some one-on-one coaching for you. If what you’re doing isn’t working then you definitely need some help. I figure the best golfers in the world shoot scores somewhere between 62 – 80 on any given day and miss cuts. So myself off 10 could shoot between 70 -90 to be in a similar range, not trying to concentrate to much on scores but it does show there is quit a big gap between best and worse in golf at any level on any given day or time frame. Where we are in that range can seem to move around over time without to much change in our ability. Andrew: Consistent golf is a bit of a myth. And yes, there is a huge gap in scores with no loss in ability. Saw Monty shoot 64 at Muirfield in 2002 (it was unbelievable!). He backed that up with an 84 on the Saturday – terrible conditions, but still a huge turnaround. Hi Cameron,Luke sounds a lot like I have been after trying to get automated and you do have hills and valleys.I play well and then go back to average but the valleys don’t seem as deep and wide anymore because you just seem to click and throw in a couple of 38 to 41’s in the middle of a bad patch and you know it is still there.I have also learnt that a bad shot doesn’t mean everything needs replacing just the divot (if you have taken one)and your confidence. Jon: that’s pretty much it. There’s no magic button to push that allows you to play well ALL the time. I have found that those really bad days are rare and most average days are now bearable. Good golf is not mission impossible and there’s almost always something to be happy about. Hi Cameron. Thanks for the effort that you’ve put in to a very measured and helpful response. It’s definitely helped me get some perspective. Isn’t it amazing how 99% of us golfers seem to have this ingrained disease where we presume we’ve lost it and instantly look for some sort of miracle fix the moment anything goes awry? As you say, I think we’ve all had it drummed in to us that this is the way we must respond when we play bad and it’s a cancer in the game. Beating this sort of thinking is half the battle I guess. I pointed out in my original post that I didn’t think I had suffered from any over expectation. Having read you’re response I now realise this wasn’t the case. I expected to continue playing well and wasn’t prepared for the eventuality of a really bad day at the office. You’ve now made me realise that I forgot to leave my expectations in the car. That’s not to say that you should expect to play badly of course – I guess it just means that you shouldn’t have any expectations either way and that they just distract from the process of walking up to each shot and hitting the stupid ball. Therefore, this also makes me realise that I had got away from one shot at a time. You’re list of possible problems is also very astute. I think off the tee in particular I’d become so over confident that I started to feel like I could hit the driver as hard as I could and had lost my rhythm. Luke: “Be clear of your intention and accepting of the result”. That’s my mate, Scott Barrow’s favourite saying. And it’s a good one. Golf doesn’t need to be a slap happy affair, but you also don’t need to overly stress and worry about some bad golf. It’s all part of the journey. … humans are obsessed with results. Who won? How’d you play? Did you hit a good shot? These are events. But golf really is a journey and when you understand that the odd poor event is less likely to get you off track. I think you’re right about expectations. If I were to have a particularly bad day, my reference point is still mostly my A game, not my average game. To some extent you always want to play at your absolute best. You forget the numerous bad days and lucky shots that have made up previous scores. Thanks Luke for sharing your perspective on valleys and troughs of your own experience. I think all golfers of all abilities go through a purple patch then hit the skids. Human instict ( as well as the golf fraternity) tells us ” Well back the drawing board/range and try to figure out what went wrong. This is floored thinking as we already have the skills with in us to play great golf. We hinder that by “Man what went wrong. I MUST figure out what happened”? Golf is not a game of perfect but I feel also it is also a game of confidence. You can build confidence by playing shots YOU know you can hit. Not what Tiger or Rory or infact your playing partners hit. Start hitting the shots you know you can play, then your confidence will get back into your game and hopefully you start to enjoy golf again. I am a struggling 22 handicapper who has come down from 26 with the usual bumpy progress. I hit a long ball which is as much a curse as it is a blessing! What I’ve found over the past 6 months is a dwindling lack of confidence in hitting long irons. My 4 and 5 irons are very inconsistent and beyond the technical facts that I have gone from slices to hooking is the biggest issue that my head plays tricks with me before and during the swing! I find it difficult not to think of the club face coming through the ball which makes me alter the swing whilst taking the shot. The yips have got me… Ironically I’d rather take a driver off the tee than an iron and also have better consistency with it! Cameron I see were this makes sense. I had a bad day just last week, and instead if dusting off and playing the game afterward, I tried to figure out what I was doing wrong. This was the wrong approach. I got worse, not better. Seems to simple to play the game but it works somehow; don’t know why it works but it does. Golfers all like to think too much – it’s human nature. Only the brave golfer can truly play the game shot after shot.